This is a press statement from Bukluran ng Manggagawang Pilipino (BMP). MANILA, Philippines - No, militant labor would not be spun around by Duterte’s spin doctors. 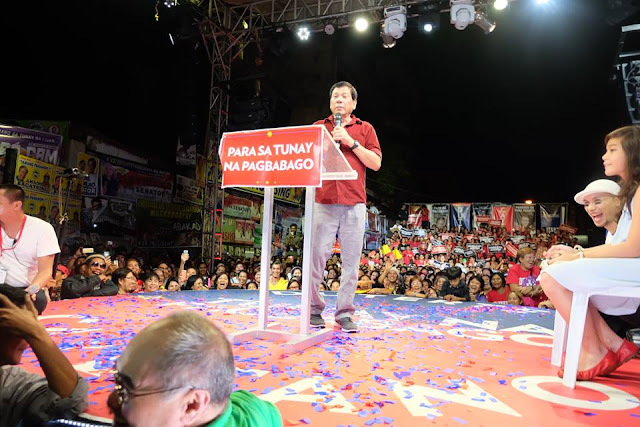 His earlier promise to abolish contractualization is now exposed for what it truly is – a mere electoral gimmick not only to gain the support of the toiling masses, especially the 1.8 million-strong trade union movement but more so to attract the attention of capitalists who may bankroll his campaign. It seems that the “ruse” has worked for Duterte and Cayetano. He now has the campaign kitty to match his well-funded rivals, especially Mar Roxas of the landed Roxas-Araneta clan. And at once, in order to reassure his financiers, he reveals his true character as a fascist and anti-labor thug. May we remind Duterte that workers do not abuse their Constitutional rights to freedom of association and self-organization. It is the employers’ who exploit “management prerogative” when they bust unions, pay starvation wages, and employ cheap and docile labor through contractualization. Mr. Duterte may feign ignorance. As a lawyer, he must know the legal concepts of social justice and human rights, especially the limitations to “property rights”. Workers form unions, not because they are provoked by radicals. They do so in order to enjoy the rights and standards that are enshrined in the Constitution, yet are wantonly disregarded by employers. We will not allow Duterte, this time, to hide behind his favorite alibi of “hyperbole”. He had the gall to utter a not-so-thinly-veiled threat to unionism. We dare him to share the same harsh words to abusive capitalists and landowners who violate every letter and spirit of the Labor Code and the Agrarian Reform Law. But he will not. Like every dyed-in-the-wool fascist, he only plays upon popular discontent with trademark demagoguery yet he is afraid to displease the oligarchy – the very minority that oppresses the impoverished majority! However, Duterte’s speech before his proclamation rally in Tondo revealed his bankrupt development agenda. He says, the country needs to entice investments for economic growth. How? By scaring the hell out of the trade union movement, i.e., by making workers surrender their rights to the altar of global capital. Cheap labor policy! It is the same neoliberal paradigm shared by post-Edsa 1986 governments. Yet, the Duterte-Cayetano camp continues to harp on its rhetoric of “change”. Unfortunately for the outspoken mayor, history is not on the side of fascism. Duterte may temporarily reap from the desperation of a people that has not benefit from the so-called democracy that was restored by the Edsa revolts. But soon, the masses will grow tired of his heavy-handed rhetoric and realize that their emancipation from poverty and misery is in their hands, not in the iron gloves of wannabe messiahs.